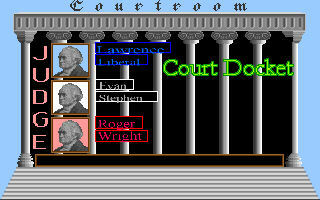 Courtroom Game - Learn the Rules of Evidence - Objection! Hearsay! Irrelevant! "At approximately 10 P.M., the evening of October 16, Officer Owen Tracker stopped a late model sedan because only one headlight on the vehicle was working. Officer Tracker, after a radio check, ascertained that the driver's registration and license were in order. "However, he became suspicious when he observed that the rear license plates were fastened to the car by wire. "Officer Tracker sought further identification of the vehicle and its occupants. He opened the front car door and looked for the Vehicle Identification Number (VIN) imprinted on the side of the door. As he opened the door, he smelled the odor of marijuana. "Officer Tracker then ordered the oocupants out of the vehicle, searched the vehicle, and found half a marijuana cigarette in the front ashtray. "Officers Tracker and Joe Lebaron subsequently searched the trunk and found $4800 in cash and 24 one-pound bags of marijuana. They arrested the driver, one Juan Merry, for possession of narcotics. "The defendant claims that the police had no 'probable cause' to search his vehicle, and that the evidence should be suppressed because it is the result of an illegal search." Choose from conservative, neutral or liberal. Jurisprudence is not an exact science. One judge, with the same facts at hand, may overturn an earlier conviction. The judge also has to rule on objections and questions of evidence. In Courtroom, in the case where the two opposing attorneys disagree on a point of procedure or evidence, the Courtroom "liberal" judge has a tendency to decide the point in favor of the defense. The "conservative" judge more often sides with the prosecution. A third choice is to select a completely neutral judge. There is a full caseload of crimes and defendants to choose from in the Fairview Criminal Court Docket. Sixteen cases, such as bank robbery, narcotics, manslaughter, burglary, fraud, etc. are available for trial. Each case includes one or two defendants, eight witnesses and a variety of material and testimonial evidence. Each case may be tried more than once - evidence and testimony will be different. Sixteen cases, such as Robbery, Fraud, Manslaughter, Narcotics, etc. Eight witnesses for each case. Over 1900 pieces of testimony and material evidence. Cases may be replayed with differing scenarios and testimony. Based on real crimes and criminal trials. Game rules adopted from federal guidelines on courtroom procedures. Educational -- Based on a semester-long course that all law-school students take. Stimulating -- Helps sharpen reasoning power and logical thinking ability. Can help you spot fallacious reasoning in others. Requires only 8 Megabytes storage space, runs on Windows 95,98,2000,XP and possibly Vista. Sorry, only Windows version available at this time. Linux version to arrive soon. 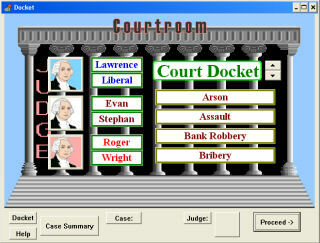 Courtroom is available only via direct download from this web site. Original suggested retail price of $49.95. Now pay only $16.95 for this educational and enlightening game! 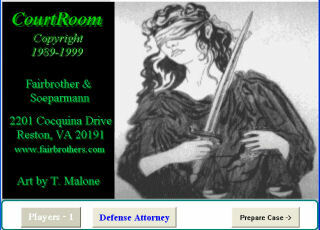 To start raising objections in your own Courtroom, go to the catalog and follow the download instuctions.